When the children drew pictures of our school, it always looked as if they were drawing a jail. They would start with a big rectangle, and then fill it with countless little squares until the windows started to overlap. Then they would draw a bigger rectangle around the perimeter, so the chain link fence became a magic force field, perpendicular to the ground. It perfectly enclosed our school, cutting down under the imaginary daisies and up into the waxy blue clouds. The children didn’t know any better. To them, every school was just like our retired Milwaukee Public Schools building at 62nd and Congress. The bus would drop them off every morning in their too-big backpacks, and it was always a new beginning, as if yesterday had never occurred. From my post at the bottom of stairwell six, I watched them descend into the basement that housed our kindergarten wing. They precariously clutched a grimy rail on one side and a sibling’s hand on the other, stepping twice on each stair in the clunky snow boots that got donated every winter. Every morning, all but the bravest grinned and adverted their eyes as I greeted them, as if they were surprised I remembered their names. Then their siblings would help them unzip their jackets and hang them in the lockers designed for middle school students, on hooks they couldn’t reach. The children would hold their breath and pause in the doorway, hugging their red folders, just for that moment fully aware of what it meant to pass through that threshold. For the holidays, the art teacher had the children trace their hands on green construction paper and glue them together to make evergreens. They made a mess with the Elmer’s squeeze bottles and glitter shakers, and I marched them upstairs to the bathroom in single file with their sparkling fingers outstretched. The music teacher taught them to sing “Silent Night” with sign language, and even though I disagreed with the religiosity, I couldn’t help but think they sounded like little angels. We were a charter school, mostly Hmong, half Christian and half Shaman. Most of the teachers were Christian, and Santa Claus was tacked to the bulletin boards every winter, but no one put up a fight. “Sleep in heavenly peeea-ce,” the children sang. Some of them still barely knew English, but they knew that word. and in my community each day. When I tested them on it, some of the children would proudly finish, “And inmyumunity each day.” I tried to teach them what community meant, but never found the right words. Soon I realized that maybe I didn’t know myself. “Teacher, a bad guy go down there, and he take my TV,” one girl told me, as we passed another teacher’s display of Santa Claus going down a chimney. It was the last Friday before Christmas, my third year of teaching, the year of Sandy Hook. Our playground, just an expanse of blacktop with the basketball hoops ripped out, had turned into a sheet of ice surrounded by a ring of hardened snow. We normally had outdoor recess unless it was fifteen degrees or below. “Go play,” I would tell the children. They would tug at the giant knot of jump ropes, always hoping to untangle one, but it never worked. Then they would run to the far reaches of the blacktop and poke the ice with their ungloved fingers until one of them would decide to throw a chunk and watch it shatter, and I had to blow the whistle. If I saw a group of them gathered, it usually meant someone had scraped a knee, and I would use the walkie talkie to call the office. “You look like a police,” they said. Once they were huddled around a dead sparrow that must have fallen, immaculate, from the air. Once I saw a group of them stamping all over a snow bank. “We are making sticky rice,” they said. But that Friday, Mrs. Vang, the head secretary, came over the loudspeaker. “Please excuse for this interruption,” she said. “We have indoor recess.” Mrs. Vang always said it like that, “Please excuse for this interruption,” and no one wanted to correct her. It became something familiar. Mrs. Vang had been through the war in Laos and was like a grandmother to all the children, although she had the luminous skin of someone much younger, and it didn’t seem quite possible. She knew all 700 children by name, along with the story of each family, whose father worked nightshift and whose uncle lived in Thailand and who went to daycare after dismissal and who was a picky eater. On particularly cold days, she cooked for the entire staff. She made industrial-sized batches of nqaij qaib hau xyaw tshuaj, chicken porridge with herbs, and when summer came, she would make nab vam, a dessert of iced coconut milk with rainbow layers of tapioca. I took the children to the small gym, where I tried to teach them to play “Duck, Duck, Goose.” Some of them couldn’t figure out when to stop and would keep looping around the circle as we shouted, “Sit down, stop!” My shyest student, Eli, was too bashful to run when tagged, but we still made sure he got a turn to be “goose,” because that was fair. Eli was not only the shyest, but the smallest, so tiny his mom had to fold his waistband over and sew it there, because they didn’t make uniforms in his size. On the first day of school, the other children had asked me, “What is a baby doing at school?” They were just curious, and once I explained to them that people come in different sizes, they always made a special effort to include him. Still, Eli only talked in private. “Teacher,” he would whisper during snack time, “My mommy’s taking me to Chuck E. Cheese tomorrow.” Eli only raised his voice above that whisper during fire drills, when he would start screaming and run to me with outstretched arms, while all the other children stampeded onto their squares, excited to do something different, excited they knew the procedure. “I don’t want a fire,” he would say, no matter how many times I tried to explain the word drill. At our school, none of the teachers ever had time to go online, so none of us heard the news during the day. After the children were checked off on their buses, we had a Christmas party with a sock exchange. I got a pair of red and silver striped socks and put some cookies and peppermint bark in a napkin for later. Someone had a hand bubbler, a twisting stem of thin glass with bulbs on each end. When we cupped the bottom part in our hands, the red liquid inside would rise and fall depending on the person’s temperature. We laughed, trying to figure out whose hands were the coldest. I was driving past a McDonald’s on Fond du Lac when I heard about Sandy Hook. I became suddenly very aware of the fact that I was crying and turned the radio off. Whatever I did, it would be wrong. I ate all the cookies and peppermint bark and felt my skin crawl with the sugar. That weekend, I went to my friend Melissa’s Christmas pageant. Melissa and I had met in the hospital. She was the only one who understood when I got caught hiding food in my pockets, and then I gained weight, and she didn’t. She looked impossibly thin in all black. Her anorexia had started at age eleven, and, after that, she never grew any taller. She looked like a child standing among the adult choir. The priest gave a moving sermon I don’t remember. The children were beautiful, of course. “It’s terrible,” Melissa said to me afterwards. “What do you think? You’re a teacher.” Melissa was never able to keep a job or finish a semester of school. Her eyes looked like they would swallow her face. Before dawn in Milwaukee, you could tell you were in a bad neighborhood, because there would be fewer streetlights. On foggy mornings, once I crossed Holton, it was like passing into a dark cloud. Often police cars would park along Locust, flashing in silence, casting the street in a shade of red. I would stop at Starbucks and order a passion tea that I sipped through a straw as I walked up to the building. On Monday, the principal, Mrs. Moua, stood before the entrance, fiddling with something. “Make sure you close the doors behind you,” she said. At the end of the day, I had not become a better teacher. We had another meeting in the library. We were all wearing our Christmas socks. A third-grade teacher raised her hand and said she had taped a piece of black paper next to her door, so it would be ready to cover the little window, just to be safe. Everyone agreed that was very important. Mrs. Moua told us about Code Blue. If a suspicious person entered the building, Mrs. Vang would go on the loudspeaker and say, “The crow is out.” That meant we had to lock our doors, but we should go on teaching. If the situation escalated, she would come on again and say, “The crow is flying,” and then we would have to make the children duck and cover. The next day, before the loudspeaker came on, we were sitting in a circle playing a game with a cardboard box. Eli didn’t want a turn, as usual. He looked like a small creature, ready to flee. I showed them how to duck and cover. The children fell over one another, and chairs toppled over, as they squirmed into their positions under the tables. I couldn’t tell who had started to giggle. “This is not a game,” I said. Then there was silence. Just Eli crying from somewhere. I had forgotten to tape the paper and saw Mrs. Moua’s face flash past the window. She jiggled the doorknob, testing the lock. Eli wailed. My eyes began to adjust to the dark, and the outlines of the classroom started to come into focus, the rows of labeled bins in their cubbies—pattern blocks, linking cubes, Play-Doh, Legos—and pencil boxes positioned over their nametags. The ABC books in alphabetical order. The carpet with a square marked off for each child. On the first day of school, I had told each of them, “Look, this is your name. This is where you get to sit. This is your special spot.” From under the tables, still out of view, some of the children were starting to giggle again. “This is not a game,” I said. I yelled it, and it worked. “You just want everything to be beautiful,” Mrs. Moua had told me during an evaluation, and of course, it was wrong to want that. A child would always cry, or sneeze, or pee, or vomit, and you had to deal with it. A child would have arms covered in bedbug bites, or a jacket with a broken zipper, and you had to deal with that, too. But inside the classroom I had thought I could make my own rules. I always wanted perfection. The pencils go here. The markers go here. The scissors go here. The glue sticks go here. The crayons go here. The paper goes here. Let’s pretend now. The children go here. 2015 Fiction Contest Judge's Note by Nickolas Butler: “Duck, Duck, Goose” attempts to deal with so many societal issues our culture is grappling with today: violence, school shootings, poverty, education. Finely written and concise, this story is the product of an author who demonstrates an intimate understanding of our urban schools and children. There is much to admire in this little gem. Erica Kanesaka Kalnay lives in Madison, Wisconsin, where she writes fiction and studies Victorian literature and childhood. She has an MFA in Creative Writing from New York University. 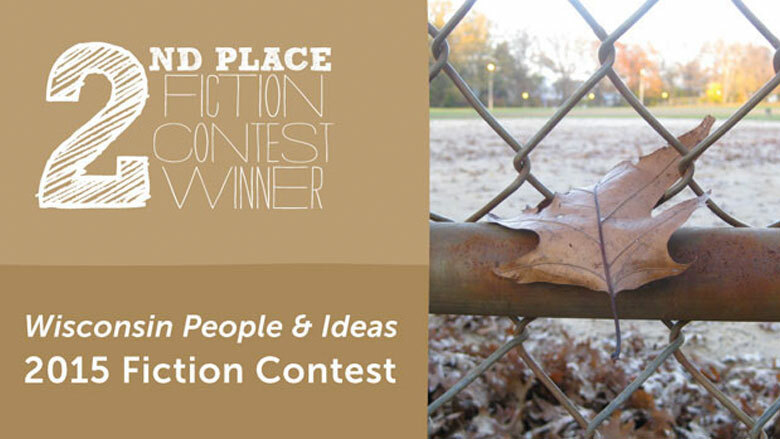 Kalnay is the second-place winner of the 2015 Wisconsin People & Ideas Fiction Contest.